RTI Surgical Issues Presentation Outlining Why Stockholders Should Vote for the Company's Director Nominees on the White Proxy Card - RTI Surgical Holdings, Inc.
ALACHUA, Fla. (May 6, 2016) – RTI Surgical Inc. (“RTI” or “the Company”) (Nasdaq: RTIX), a global surgical implant company, today issued a presentation titled “RTI Surgical: Creating a Stronger Governance Structure and Building Long-Term Stockholder Value.” The presentation outlines why RTI stockholders should vote the WHITE proxy card FOR the election of Peter F. Gearen, Brian K. Hutchison, Thomas A. McEachin, Jonathon M. Singer, Paul G. Thomas, Nicholas J. Valeriani and Shirley A. Weis, RTI’s highly qualified director nominees, at the Company’s upcoming annual meeting of stockholders on May 26, 2016. Messrs. Gearen, Hutchison, and McEachin and Ms. Weis are existing directors. The presentation can be found at www.rtix.com/en_us/investors/electronic-ir-kit. After careful evaluation, the independent nominating and governance committee unanimously concluded that RTI’s director nominees are the better leadership team to direct management and the business and increase long-term stockholder value. The nominating and governance committee concluded that Krensavage Partners, LP’s (“Krensavage”) nominees are less qualified than RTI's nominees to be directors of RTI. RTI is committed to the right governance framework to increase stockholder value and has refreshed its board in an attempt to ensure that the directors will help the Company respond to a changing industry and regulatory landscape. If all of RTI’s director candidates, including the three new ones, are elected to the RTI board at the upcoming annual meeting, seven of RTI’s nine directors will have terms of less than three years. Krensavage rejected RTI’s reasonable settlement offer that included the appointment of one of Krensavage’s nominees. Krensavage prefers to pursue a proxy contest at this time. RTI has consistently engaged with Krensavage in an effort to avoid a potentially long and expensive proxy contest. RTI is making significant progress executing its plan to grow revenues and increase margins. Strategic steps are delivering stronger financial performance, including 2015 year-over-year growth in revenues of 7.4% (9% on a constant currency basis), EBITDA of 36.3% and adjusted net income per fully diluted common share of 109%. The Krensavage nominee, John Watts, was interviewed by RTI’s nominating and governance committee as part of its evaluation process. During the telephonic interview, Mr. Watts stated that, in his view, his skills were duplicative with those of current board member Ms. Weis. Krensavage subsequently notified the Company that it had decided to replace Mr. Watts with Darren Lehrich. RTI's total insider ownership stake is greater than the mean ownership stake of 22.5% for RTI's comparables as chosen by Krensavage. The RTI board includes significant stockholder representation with two directors associated with the Company’s largest investor, Water Street Healthcare Partners. RTI’s R&D and SG&A expenses as a percentage of sales are below the industry mean and median. Krensavage’s comments on expenses are misleading because they focus on absolute dollar amounts and ignores normal sector spending levels. 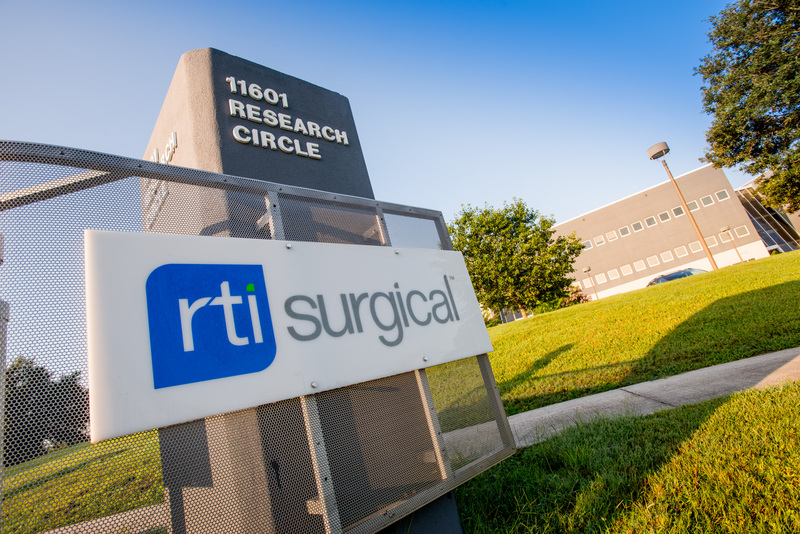 RTI Surgical filed a proxy statement with the SEC in connection with the solicitation of proxies for its 2016 annual meeting of shareholders. Shareholders are strongly advised to read RTI’s 2016 proxy statement and the accompanying WHITE proxy card because they contain important information. Shareholders are able to obtain copies of RTI’s 2016 proxy statement, any amendments or supplements to the proxy statement and other relevant solicitation materials filed by RTI with the SEC in connection with its 2016 annual meeting of shareholders free of charge at the SEC’s website at www.sec.gov, on the company’s website at www.rtix.com, or by writing to our Corporate Secretary at our principal office at 11621 Research Circle, Alachua, Florida 32615. RTI, its directors, and its executive officers may be deemed participants in the solicitation of proxies from shareholders in connection with its 2016 annual meeting of shareholders. Information concerning persons who may be considered participants in the solicitation of RTI’s shareholders under the rules of the SEC is set forth in public filings filed by RTI with the SEC and is set forth in its proxy statement relating to its 2016 annual meeting of shareholders.